With a clean brooder, fresh feed and clean water, your chicks are settled in and off to a good start by weeks two and three. It’s time to enjoy them. Chicks are very social and will provide hours of entertainment. You will see their unique personalities emerge as each day goes by and they will grow into mature chickens before you know it. Now, listen to them. Chicks will emit a soft cheeping sound when everything is right in their world. This sound can be used as a means of determining their comfort status. A chick that is stressed due to conditions being too hot or cold, wet litter, or one that is hungry or thirsty will have a shrill or higher pitched cheep or may cheep very rapidly. Translate this as a call for help and look for the problem. The brooder temperature should be reduced to 85°F (lower 5° each week to a minimum of 65°F). Chicks should be exposed to at least 10 hours of light per day after the first week. Brooder guard can be removed now if it hasn’t been already. Chicks should be able to find the heat source by this time. After the brooder guard is taken out, the feeders and waterers can be moved further away from the source of heat. As the chicks become more active and continue to grow, this will give them more space for exercise and will help keep the feeders and waterers cleaner and keep them from being heated by the heat lamp. Any paper or pans used to feed should be taken out if you are sure chicks are eating from the feeders. The level of feed in the feeders can be decreased a little each week until they are half full at all times. This will help reduce the amount of feed waste. Keep checking on chicks to make sure they are comfortable. Again, chick behavior is the best measure of the ideal brooder temperature. Continue to provide unlimited feed and water at all times. Clean and refill waterers daily. Remember, good sanitation is critical to avoid health problems when caring for young chicks. Keep litter dry by removing wet and soiled litter and replacing it with clean, dry litter. Always store feed in a well-ventilated, dry area that is insect and rodent free. A complete and balanced feed will provide all the nutrition your chicks need to grow into healthy, productive birds. Feeding extra grains or scraps to your chicks can reduce the amount of complete feed they eat and may prevent them from getting all the nutrients they need to grow and develop properly. 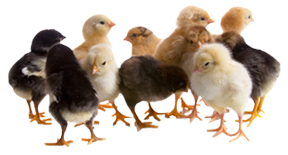 One of the most common and deadly diseases in chicks is coccidiosis. Caused by a parasite, it is spread through the droppings of infected birds. Coccidia love damp, warm environments so wet litter and unsanitary brooder conditions are a prime breeding ground for this parasite. Most birds will come into contact with coccidia at some time but appear to be most susceptible to the disease between 3 to 5 weeks of age. If chicks are healthy and live in a dry, clean, well-managed environment, they are often able to fight it off or may only get a mild case, which can even go undetected. Symptoms of coccidiosis can include diarrhea or bloody diarrhea, weight loss, no desire to eat, ruffled feathers and an overall sickly appearance. If you suspect coccidiosis, seek treatment immediately. Commercial vaccines and medicated feeds are available to prevent coccidiosis. However, the ideal prevention for this disease is maintaining a dry, sanitary, stress free environment through good management. If you suspect disease or some other serious health problem in your flock, contact your veterinarian for diagnosis and treatment options. This entry was posted on Monday, February 16th, 2015 at 10:10 am	and is filed under News & Updates. You can follow any responses to this entry through the RSS 2.0 feed. Both comments and pings are currently closed.